See President Obama read mean tweets about him on Jimmy Kimmel Live in the video above. There is no question that the letter to Iran signed by 47 Republican Senators was irresponsible. I will leave it to others to argue whether it breaks the law or constitutes treason, but it definitely ignores how foreign policy is conducted in the United States. At very least this was a curious move from the party which claims to be such strict backers of a Constitution which in reality they cite only when convenient. My initial reaction was more basic–why would anyone, regardless of party, want to derail an effort to negotiate a peaceful solution to having nuclear weapons in Iran? Yes, there is another election in two years and the United States could change course, but don’t undermine the ability of the current, and every future, president to negotiate on behalf of the United States by suggesting that agreements with the President of the United States are meaningless. Wouldn’t destroying much of Iran’s nuclear infrastructure merely delay its progress? Perhaps, but we can strike as often as necessary. Right, repeated bombing raids “as necessary.” What could possibly go wrong with that approach? 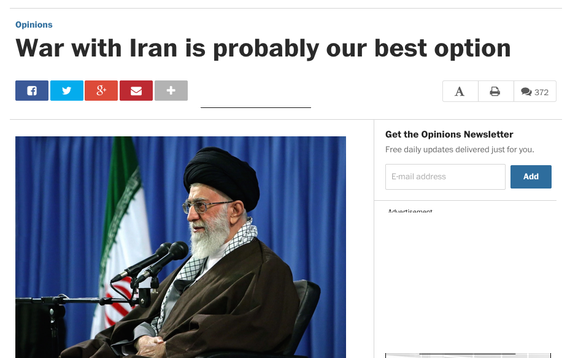 Yes, “surely the United States could best Iran.” Surely we could polish off those backward Viet Cong. Surely invading Iraq would work out great. (I haven’t taken the time to see if the author was a fan of invading Iraq, but I have a guess.) Surely the operational details of these engagements are a concern only for the small-minded among us. How would we think about a “scholar” in some other major-power capital who cavalierly recommended war? How would we think about some other capital-city newspaper that decided to publish it? The Post’s owners (like those of the NYT and other majors papers) have traditionally had a free hand in choosing the paper’s editorial-page policy and leaders, while maintaining some distance from too-direct involvement in news coverage. Jeff Bezos, behold your newspaper. I say courage because signing an agreement — any agreement — would undoubtedly be a political home run. The news media would repeatedly feature the signing ceremony. The coverage would rehearse the long and tortured history between our two countries and exalt at the dawn of a new era. The Iranian pooh-bahs would appear tame and responsible. The president would look, well, presidential.An agreement would also boost the prospects for Hillary Clinton: achievement by association. Walking away from all that would be courageous. It would also be right. As I noted yesterday, this is starting to become an issue going into the 2016 elections. This country rushed into a disastrous war with Iraq based upon the emotions following the 9/11 attack and lies from the Bush administration. During the 2016 election we need to carefully examine the views of the candidates regarding war and peace. This is not limited to the Republicans. Hillary Clinton’s views also need to be reviewed. While she has correctly criticized the Republicans for this letter, her views regarding use of military force must be questioned. Not only was she often among the most hawkish voices in the Obama administration, she was in the Joe Lieberman wing of the Democratic Party in urging war with Iraq based upon non-existent ties between Saddam and al Qaeda.